The problem is his plagiarism. Click here for a refresher. Then he spent NYE on his Twitter sending out plagiarised apologies. You can see all his tweets here. 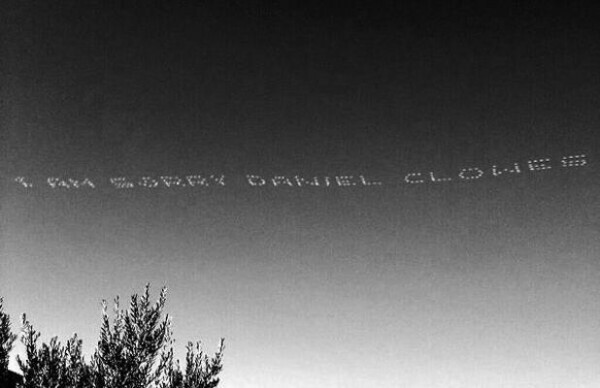 Then he hired someone to skywrite an apology to Daniel Clowe. It’s exhausting. It’s terrifying. Imagine if you were dating him? He’s that guy who gets aggressive with his “sorrys”. I’m SORRY OK! Why won’t you f-cking ACCEPT MY APOLOGY! Do you want me to get run over? Jump in front of the train? Cut myself? To prove to you how sorry I am? You don’t want that guy as a boyfriend. But there’s more. Last night Shia participated in an online philosophy chat with Bleeding Cool after one of the reporters reached out to him about this mess. He has trouble separating “their” from “there” but it would seem, preliminarily at least, that he didn’t lift anything this time, although it doesn’t make his ideas – whether they’ve been borrowed from someone else or not – any less controversial. On the issue of copyright, for example, he seems to think that the laws are too narrow. And that “It’s not plagiarism in the digital age – it’s repurposing”. So… it’s ok for him to copy your sh-t and not credit you for it because… the internet. That’s basically what he’s saying, inspired by a few ideas he picked up on a message board and some wiki pages here and there and yet totally impressed by himself. Click here to read the full transcript.